My running journey began in earnest back in the mid-90s. Prior to that, I was a keen swimmer and cyclist who’d dabbled a bit in running but never taken it very seriously. That all changed with a Race for Life 5k, which changed my life as it has for many other people. A friend asked me if I’d train with her and, as you all know, I became totally hooked. She didn’t – she ditched running as soon as the race was over – but I kept on going, and going, and going. 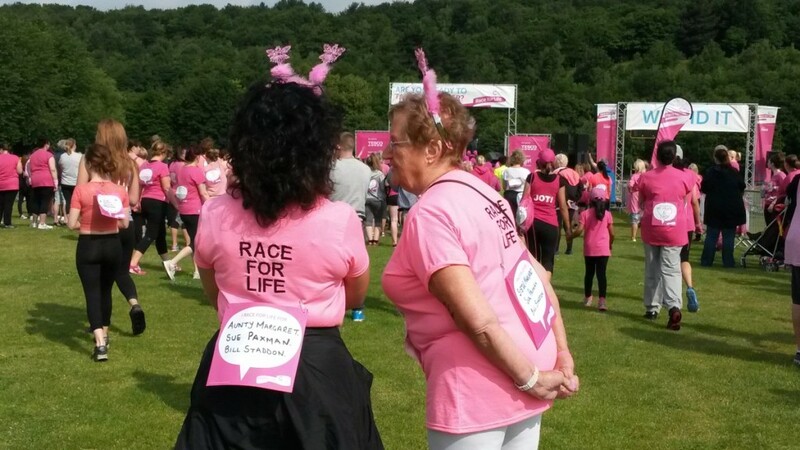 Yesterday, for the first time in almost 20 years, I joined the Race for Life in Huddersfield, just because I could. It was a stunning reminder to me of how far I’ve come (or how far I’ve run!) since that first time nervously lining up with thousands of other women. Much more than that though, it was a reminder of how special the Race for Life series is in encouraging women to be active. They played ‘Get Your Freak On’ at the start line, as they no doubt do at the many other RfLs around the country and I realised that these races are really the Grandes Dames of the This Girl Can campaign, encouraging women to get active for over two decades. 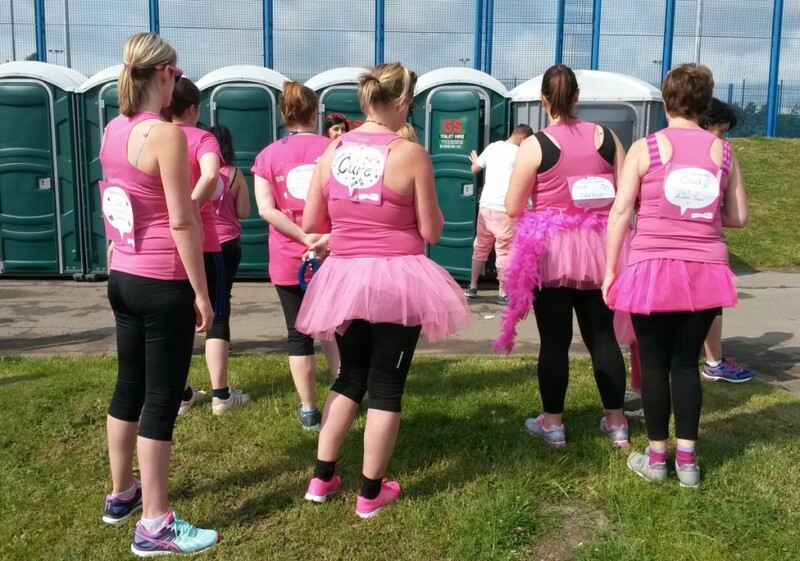 If you’ve ever done a Race for Life, you’ll know that everyone dresses in pink (except me, the rebel in blue – I forgot about the pink). There are boas, deely boppers, balloons and pink wigs. There were tears before the start line, mainly mine, at the sight of all the ‘I’m running in memory of…’ cards on the runners’ backs. My brother died of cancer and the thought that many of the people around me were going through similar trauma really hit me in the gut, as did the one minute silence they do at all the races. Those memories aren’t bad ones, though, more reminders of how lucky I feel to be able to run and, hopefully, sometimes, in small ways make a difference. The Race for Life takes a similar approach – remember but fight and be glad you’re able to do what you do. Cue Pharrell, Katy Perry, hula hooping and a mass warm up – all upbeat, fun and glad-to-be-alive stuff. 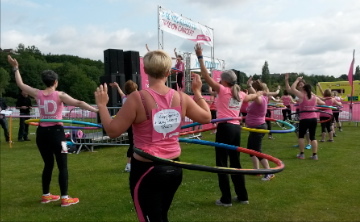 There were 1700 participants, who raised nearly £100000 between them – pretty impressive for a Sunday morning. They ran, walked, pushed wheelchairs and buggies. They laughed with their mates and their kids and they were all amazing. I loved it, really loved it. There was so much in there that we could learn for the big, ‘serious’ races we all do, not least being grateful for our chance to participate at all. If you’ve never done a Race for Life, treat yourself. You could treat it as a goal in itself, a fun way to raise funds for charity, as training for longer runs or maybe just see it as an absolutely lovely way to spend a morning. Whatever your reasons, glad to be alive may never feel so good. This is one of a series of posts in conjunction with the KiQplan Race For Life Training App, that helps to build up a 5K or 10K training plan from a base of no running whatsoever. The app is nutritionist, personal trainer and coach in one. Along the way, it pairs up with your fitness tracker, to review the effect that your sleep, exercise and nutrition have on your 5K or 10K training goals. Race for Life in Leeds was the first ‘proper’ run I ever did, way back at the end of the 90s. At the time I didn’t have a clue about cancer – it was just a horrible thing that other people got. I was really taken about by how moved I was by the ‘In memory of’ signs. Sadly, 15 years later, it was me wearing the sign at my first half marathon as my brother also died from cancer. Thank you for a lovely post reminding me of something very special.